SHSU will ‘attack’ school spirit with several activities throughout the week leading up to the Bearkat football team ‘axing’ the ‘Jacks in Nacogdoches on Oct. 30. On Monday (Oct. 25), students and administrators will gather at the Alumni Fountain at 11 a.m. for the second annual Orange Attack pep rally. University president James F. Gaertner and vice president for Student Services Thelma J. Douglass will speak, as well as student athletes and a possible “surprise” guest, according to Student Activities student coordinator Brandon Cooper. “ We want to have a spirited pep rally to boost student enthusiasm and school spirit for the upcoming game against our rivals, the SFA Lumberjacks,” he said. Other administrators, the Orange Pride dance team, cheerleaders and student organizations will also be on hand at the event, where there will be prizes and other giveaways for participants. 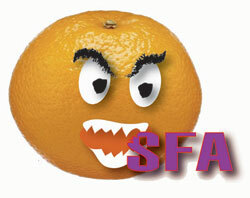 Orange Attack began last year in hopes of beginning a new tradition, in conjunction with Operation Orange, where the campus is decorated in Bearkat colors, during the week SHSU plays Stephen F. Austin State. Last year’s turnout was good, with about 1,000 students attending, Cooper said, adding that they are hoping for at least that many this year. With many departments on campus serving as the event’s sponsors, Cooper said it has turned into a university-wide effort. Other activities planned for the week include Operation Orange, which will also begin on Monday and Firefest, on Thursday at 8 p.m. at Intramural Field No. 3.